Description This Level 1 (L1) dataset contains the Version 2.1 geo-located Delay Doppler Maps (DDMs) calibrated into Power Received (Watts) and Bistatic Radar Cross Section (BRCS) expressed in units of m2 from the Delay Doppler Mapping Instrument aboard the CYGNSS satellite constellation. This version supersedes Version 2.0. Other useful scientific and engineering measurement parameters include the DDM of Normalized Bistatic Radar Cross Section (NBRCS), the Delay Doppler Map Average (DDMA) of the NBRCS near the specular reflection point, and the Leading Edge Slope (LES) of the integrated delay waveform. The L1 dataset contains a number of other engineering and science measurement parameters, including sets of quality flags/indicators, error estimates, and bias estimates as well as a variety of orbital, spacecraft/sensor health, timekeeping, and geolocation parameters. At most, 8 netCDF data files (each file corresponding to a unique spacecraft in the CYGNSS constellation) are provided each day; under nominal conditions, there are typically 6-8 spacecraft retrieving data each day, but this can be maximized to 8 spacecraft under special circumstances in which higher than normal retrieval frequency is needed (i.e., during tropical storms and or hurricanes). Latency is approximately 6 days (or better) from the last recorded measurement time. The Version 2.1 release represents the second science-quality release. Here is a summary of improvements that reflect the quality of the Version 2.1 data release: 1) data is now available when the CYGNSS satellites are rolled away from nadir during orbital high beta-angle periods, resulting in a significant amount of additional data; 2) correction to coordinate frames result in more accurate estimates of receiver antenna gain at the specular point; 3) improved calibration for analog-to-digital conversion results in better consistency between CYGNSS satellites measurements at nearly the same location and time; 4) improved GPS EIRP and transmit antenna pattern calibration results in significantly reduced PRN-dependence in the observables; 5) improved estimation of the location of the specular point within the DDM; 6) an altitude-dependent scattering area is used to normalize the scattering cross section (v2.0 used a simpler scattering area model that varied with incidence and azimuth angles but not altitude); 7) corrections added for noise floor-dependent biases in scattering cross section and leading edge slope of delay waveform observed in the v2.0 data. Users should also note that the receiver antenna pattern calibration is not applied per-DDM-bin in this v2.1 release. Level 1B DDM Calibration Algorithm Theoretical Basis Document, S. Gleason, CYGNSS Project Document 148-0137, Rev 2, 20 Aug. 2018. Level 1A DDM Calibration Algorithm Theoretical Basis Document, S. Gleason, CYGNSS Project Document 148-0136, Rev 2, 20 Aug. 2018. Ruf, C., R. Atlas, P. Chang, M. Clarizia, J. Garrison, S. Gleason, S. Katzberg, Z. Jelenak, J. Johnson, S. Majumdar, A. O'Brien, D. Posselt, A. Ridley, R. Rose, V. Zavorotny (2015). 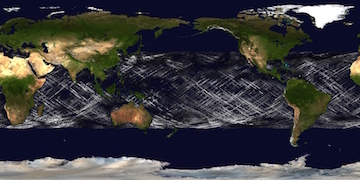 New Ocean Winds Satellite Mission to Probe Hurricanes and Tropical Convection. Bull. Amer. Meteor. Soc., doi:10.1175/BAMS-D-14-00218.1. Gleason, S., C. Ruf, M. P. Clarizia, A. O'Brien, 'Calibration and Unwrapping of the Normalized Scattering Cross Section for the Cyclone Global Navigation Satellite System (CYGNSS)', IEEE Trans. Geosci. Remote Sens., doi:10.1109/TGRS.2015.2502245, 2016. Citation CYGNSS. 2018. CYGNSS Level 1 Science Data Record Version 2.1. Ver. 2.1. PO.DAAC,	CA,	USA. Dataset accessed [YYYY-MM-DD] at http://dx.doi.org/10.5067/CYGNS-L1X21. Journal Reference Gleason, S., C. S. Ruf, A. O'Brien, D. S. McKague, "The CYGNSS Level 1 Calibration Algorithm and Error Analysis Based On On-Orbit Measurements", IEEE J. Sel. Topics Appl. Earth Obs. Remote Sens., doi: 10.1109/JSTARS.2018.2832981, 2018.